Marmalade isn’t just for your toast and ham isn’t just for Christmas. 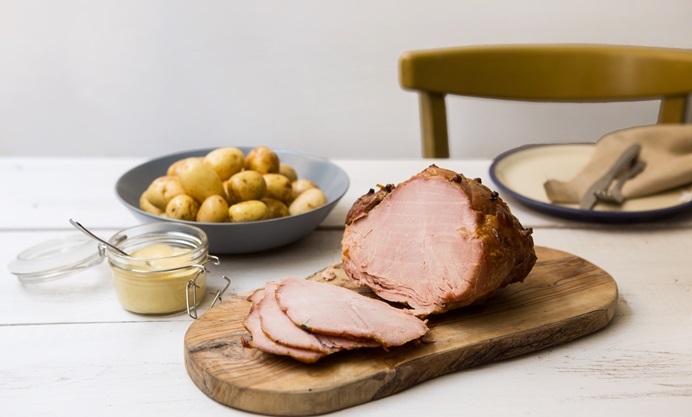 Victoria has combined the two to make this gloriously sticky and delicious marmalade glazed gammon in celebration of National Marmalade Week: a whole week dedicated to awards and festivities encouraging people to make, buy and eat more marmalade. This year, National Marmalade Week is teaming up with Hospice at Home for its ‘Go Orange’ Appeal. To take part, simply organise a fundraiser between the 2nd and 9th March with a citrus, marmalade or orange theme. How about organising a citrus-themed bake sale at your children’s school or dig some orange trousers out the back of your wardrobe and get your mates over for a night of Breakfast Martinis. You could even host a marmalade themed dinner party and rattle a tin for donations at your guests. They won’t mind. It’s for charity! One of my favourite ways to eat marmalade is liberally spread over a quiveringly tender hunk of gammon, studded with cloves and ready for a blast in the oven. 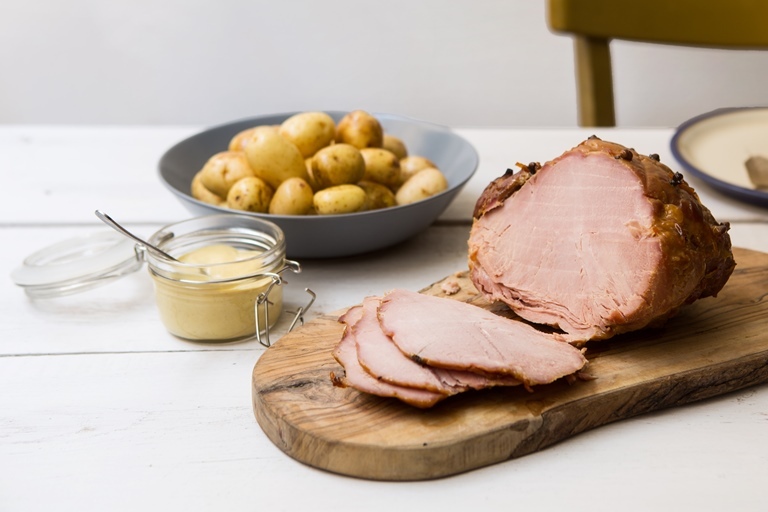 There’s no doubt that a whole gammon is an easy and versatile way to feed a crowd and it has the added bonus of providing plenty of cold cuts for teatime sandwiches as well as a vat of homemade ham stock for soup. But you don’t have to be feeding the 5000 for an excuse to indulge in some pink, porky goodness. I bought a small (1.5 kilo) piece of gammon from my local butcher’s, before boiling, glazing and baking it. Although not the cheapest cut of meat at just under £18, there was enough meat for lunch for 4 with plenty of leftover cold cuts for us to scoff with pickles and chutney the next evening. I also made a full-bodied butternut squash and sage soup with the stock, which made enough for 12 portions. If you think how much a measly 3 slices of ham in a plastic packet at the supermarket costs, suddenly that £18 doesn’t seem so steep after all.